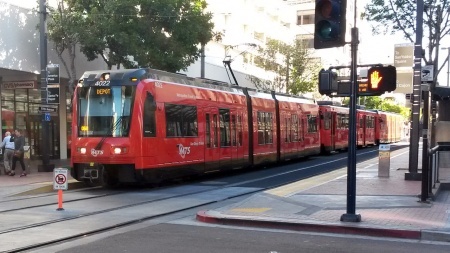 San Diego Trolley is a light rail system serving Downtown San Diego, Mission Valley, La Mesa, El Cajon, Santee, Chula Vista, National City and the international border at San Ysidro. San Diego Trolley uses proof of payment fare system. All riders must have a valid ticket or pass prior to boarding. Ticket machines are available at all stations. Select a station through the map above for access and parking information on individual stations. Before you board the trolley, you need to buy a ticket or pass from a San Diego Trolley ticket machine located at every station. At some stations, machines are located on one of the two platforms only. At elevated or underground stations, ticket machines are located at the station entrances. On the platform, board the train that goes to your station. The headsign on the vehicle will show the destination and (for some) line color. As the train comes to a stop, press a button adjacent to the doors to open them. On the train, announcements will be made for the next station. Press a button near the door way to open them. Bicycles can be taken aboard the trolley at all hours on all cars with no additional fare. During rush hours, one bike is permitted on each car. At other times, two bikes are permitted. Board the train through the front or rear door of the car. Stand with the bike during the trip. All trains should have at least one low floor trolley car, which have ramps for riders with mobility device. To board low floor trolleys, use the two center doors of the car. Press one of the blue buttons with the wheelchair symbol on the door to deploy a ramp. This page was last edited on 12 November 2018, at 21:24.